The Duke of York met leaders of the nuclear industry today on a visit to Amec Foster Wheeler’s laboratories at Birchwood Park in Warrington. His Royal Highness took part in a round table discussion with senior industry executives including David Peattie, Chief Executive of the Nuclear Decommissioning Authority. The Duke of York is a great advocate for British business, entrepreneurship and skills, so this was a very welcome opportunity for leaders in the nuclear industry to share some of the challenges we currently face and to hear about the opportunities for us to export our capabilities, especially on decommissioning. We hope this update on UK nuclear will be useful to His Royal Highness in his important role to promote and raise awareness of British science, technology and engineering expertise. The Duke of York, who served in the Royal Navy for 22 years as a minesweeper commander and helicopter pilot, toured the Hydrogen Lab 3, an Amec Foster Wheeler laboratory which simulates the conditions inside the nuclear reactors that power the UK’s submarine flotilla. During the visit to Birchwood Park, His Royal Highness also saw the work of the High Temperature Facility, a new laboratory hosted by Amec Foster Wheeler which carries out materials testing on components for the nuclear power reactors of the future. 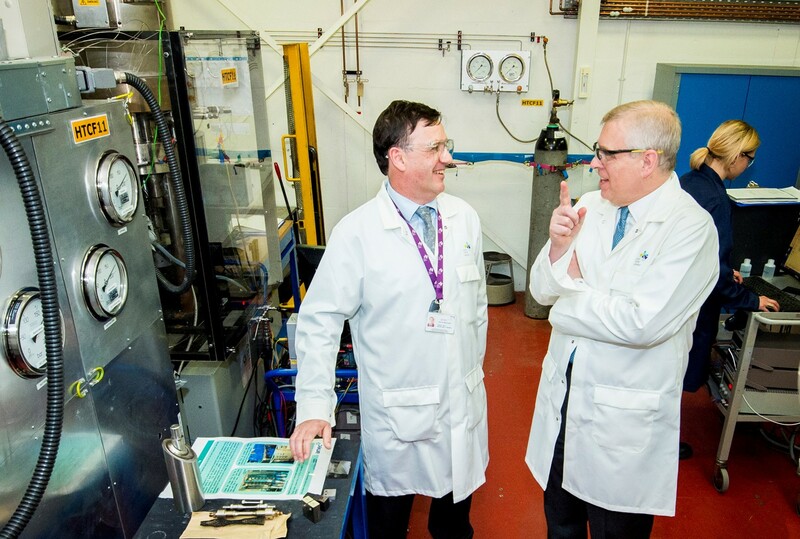 The Duke of York tours Amec Foster Wheeler’s laboratories in Warrington with Professor John Stairmand, Technical and Operations Director for Materials Science and Structural Integrity.